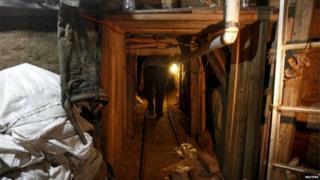 Security forces in Mexico have discovered an underground tunnel aimed at crossing into the United States. The unfinished tunnel, in the border city of Tijuana, is believed to have been built by the Sinaloa cartel with the aim of smuggling drugs into the US. Last month Joaquin "Shorty" Guzman, the leader of the Sinaloa cartel, escaped from a maximum security jail through a 1.5km-long (1 mile) tunnel. Guzman, one of the world's most wanted drug dealers, is still on the run. Officials from the federal prosecutor's office said the tunnel was 123m (404ft) long, but came just short of crossing the border. Image caption The tunnel is about 6m deep and can be accessed by a ladder. The Mexican authorities uncovered the tunnel on 30 July, but they only allowed members of the media to access it on Sunday. Members of the security forces said they had received an anonymous tip-off about a warehouse in Tijuana. There, they found the unfinished tunnel, which had rails, lighting and ventilation. It is the third such tunnel found in and around Tijuana this year. The gang believed to be behind its construction, the Sinaloa cartel, are considered experts in the building of sophisticated tunnels. Drug lord Joaquin Guzman, whose arrest in 2014 was seen as a major coup for President Enrique Pena Nieto, escaped through such a tunnel on 11 July. It led from the shower of his cell in a maximum security jail to a building outside the prison's perimeter. Despite a massive manhunt, Guzman's whereabouts remains unknown. A number of prison staff, including the jail's director, have been arrested in connection with his escape.